Cleveland, Ohio, USA: The Williams Publishing Co. Retiring from the show business and returning to, Melbourne, I went once more to coaching and followed it for little more than a year, when I was again taken sick and was obliged, when partially recovered, to, make a change of climate. I made a coasting voyage up to what was then a new country, Gipps' Land, named after Sir George Gipps, governor of New South Wales from 1838 to 1846. While there a new gold field broke out on the New South Wales side, about two hundred miles up the coast from Gipps' Land, on the Snowy river. Now there never was a gold rush but I must see it, and this one was not an exception. Off I started. Arriving there I found it had, like many others, been greatly enlarged upon, though many were doing well. There was a scarcity of beef; while there were thousands of cattle within a few miles from there, in what was called the Monoro country, but there were not men there then who would venture down and bring them up, for it was a hazardous undertaking to drive cattle in those broken ranges. I met a young man named Croft, a native of Sidney, who told me an uncle of his had a station not more than forty miles distant, of whom we could get cattle at £5 per head, and we arranged to go into the slaughtering business. He started for his uncle's station, while I remained to put up a slaughter-yard. By the time the yard was ready he was up with the cattle, and we commenced slaughtering. It was my first experience in this line of business. We killed twenty-five head. It puzzled me that he got that number when he had taken only seventy pounds in money with him. It beat my mathematical calculations, and when I enquired of him he said it was all right, he got them of his uncle. So I supposed his uncle let him have them on time. We sold to the butchers by the carcass. When we had nearly sold out Croft went back for more, this time taking a £100 in money. I supposed he would pay for what he had got on time and purchase as many more; that I would have what meat we had on hand all sold out, and on the third trip we would owe nothing for cattle. To my surprise be returned with upwards of thirty head. I was all sold out and waiting for him. The town sprang up like, a mushroom, as all mining towns do, and was named Kiandra. It is situated in the most mountainous part of New South Wales, and in the roughest and coldest part of the colony I had yet found. It was in the winter months when I was there, and the snow was falling, but not as it does in this country. There it falls and melts, making it muddy and sloppy under foot, and the air cold and damp. At the season I was there it seemed to me the most disagreeable place on, the earth. In summer it is said to be delightful. The change had done me good. I had been away from Melbourne only three months, and was as rugged and' healthy as ever I had been in my life. But this place was- away out of the world to me, and I had become thoroughly disgusted with it. Nothing would induce me to remain there, not even the assurance of a fortune. Besides, I did not like the memory of that butchering business, and was anxious to put as many miles between me and Kiandra as possible. I had acted in good faith and my conscience did not trouble me. I had sold out honorably and to good advantage, and was ready—not 'waiting' like Micawber, - for something to turn up. There is a vacancy in the Victoria Exploring Expedition which will be held open for you up to its leaving Melbourne. If you think favorably of it, come to Melbourne as soon as convenient, as it intends to leave on the first of August. A letter received from Robert O'Hara Burke at the same time of the above, informed me that he had been appointed leader of the Victoria Exploring Expedition, that he was anxious for me to join it, and advising me to come to Melbourne at once, that salary was a second consideration. This was in 1860. It should be borne in mind that Australia is not an island, but a continent, nearly three thousand miles in length from east to west, and over two thousand from north to south, having an area in square miles greater than the United States and about equal to the whole of Europe. The country had never been explored, at least the continent had never been crossed, although there had been various attempts to do so. The first was by Dr Lekhart, a German, who started out from Sidney in 1851, but never was heard from afterwards, nor have any traces been found to this day, for any certainty, of the fate of the explorer and his party, though there have been rumors of traces, but when followed up have proved to be wholly mythical, and there is more known to-day of the fate of Sir John Franklin among the ice floes of the Arctic seas, than of Lekhart in the interior deserts of Australia. The government has expended many thousands of pounds in searching for the truth of these fabulous reports, which at first seemed plausible, but when investigated, each and all proved alike untrue and disappointing. The next expedition was that of Sturt, who reached the interior as far as Cooper's creek, where he wandered about for some time and then returned, reporting the interior one vast desert of sand and sage brush, wholly destitute of grass and water. Subsequently Macgregor took the field, but he got no further than his predecessor, and returned bringing the same discouraging report. Besides these, there had been many private individuals, and preeminently, Sir Thomas Elder, an Australian millionaire of noble spirit, who made exploring expeditions, looking for ranges and pastures for sheep and cattle; but all told the same discouraging story on their return, many coming near losing their lives in the loss of their horses by starvation. In 1859 a Mr Stuart, equipped at the expense of Sir Thomas Elder, started from South Australia with two companions, and came nearer to success than any previous party. He was obliged, however, to return for want of provisions. The Victorian government, in 1860; took consideration of the subject. Private subscriptions were tendered, one man giving £1,000, and hundreds of others smaller, but very respectable sums. The government voted £50,000. The management of the expedition was put into the hands of the Royal society. They sent to India and procured twenty-six head of camels with drivers, and appointed a leader and selected their men. I had read of the contemplated expedition and thought I would like, to be one of the party, but knowing the difficulty there was in getting position in government affairs without powerful friends to back one, while at the same time there were plenty who could get places, though no more fit than children, from having friends in the government or in the Royal society, my mind did not long dwell upon the subject. Therefore, one can judge of my surprise when I received the letters before mentioned. I at once set out on foot for Melbourne to meet Mr Burke and present myself to the officers of the Royal society. It was one hundred and forty miles to Albury, a broken and unsettled country for the first hundred miles, houses thirty miles apart, and the most dreary country in Australia. My horse had been stolen, which necessitated my starting on foot - it was a lonely country for that business. I heard of him a year or more afterwards in New Zealand, having met the man who stole him; he laughed at me, thought it was a good joke, and told me he afterwards sold the horse. So it is a reality that there are places where, as the countryman said of the city, 'They cheat each other and steal and call that business.' I walked the distance in four days. When within eight miles of Albury, just at dark, and when I was making haste to reach a house I knew to be only three miles distant, I made a misstep, and in trying to save myself, sprained my ankle and fell. For twenty minutes it seemed to me I never suffered such excruciating pain in my life. I lay and rolled upon the ground. It was three miles from a house, and cold and sleety weather; could not put my foot to the ground; and what to do was more than I could tell, when presently I heard the sound of a spring-cart (for I had now reached the old Sidney road). I made up my mind to have a ride at any cost. When the cart came up I hailed the driver, who was a hawker, or peddler. His only response to my request for a ride was a stroke of the whip upon the horse. My case was one of desperate emergency—I must ride or die. I could not walk to the next house. I seized his horse which I held with one hand, and leveled my pistol at the driver, and there I stood and compelled him to listen to my story of agony and pain, and told him I only wanted to ride to the next house, and, what was more, I was going to do so. I would not hurt him, but held onto the reins and covered him with the pistol until I had crawled into the dray, when I gave him the reins and told him to drive on; that I would not hurt him, but ride I must and would. He never spoke a word, but drove me to the hotel three miles distant. When I slid down from his cart I could not walk. I asked him to help me in, and he did - in fact, be was so frightened he would do anything I told him. I then treated him to a glass of brandy and tendered him five shillings for my ride. He declined to take it but accepted a glass of hot brandy. By that time he had got over his fright, and he told me he was never so frightened before in his life. It was then five more miles to Albury, and he insisted on my riding in with him. I jocosely hinted that he might be frightened. 'No,' he said; that was the reason he wanted me to go with him, as he had no fear of being stuck up if I was with him. I accepted his invitation and he drove a half mile out of the way to set me down at the Exchange hotel, kept by Kidd & Brittle, Americans. The next morning a policeman arrived at the hotel and enquired of the landlord if he had any commands for the Snowy river. Mr Kidd asked him what was taking him there? He replied that he was doubtless on a wild goose chase, but he was the bearer of a letter to a man there by the name of Ferguson. Kidd told him if it was Charlie Ferguson he had only to go up to room nine to find him. A knock at my door necessitated my hobbling to it to slip the bolt, when I was surprised to find a policeman facing me. I thought of Croft and his uncle's cattle. Then I saw by his uniform that he was a Victorian policeman and would have no official business with me over the border. Responding to his civil question for my full name, he handed me the letter. It was from Inspector Bookey of Beechworth, informing me that the Royal society had written him requesting that a messenger be sent to the Snowy river to find me, fearing I would not get the letter before posted to my address. I remained at Albury that day and took the coach for Beechworth the next morning, where I saw Mr Bookey who offered to forward me to Melbourne at the expense of the Royal society. This I declined, as I did not wish to be under obligations to the society in advance. He, however, wired them that I was on my way. Mr Burke met me at the coach office and took me to the Royal society's hall, where I met the exploring committee then in session. Nothing was concluded that evening, but I agreed to make them a proposition at their meeting the next day. In accordance therewith I offered to join the expedition at a salary of £400 a year. They accepted the offer at once, and on the following day I received my official appointment as foreman of the Victorian Exploring expedition, Robert O'Hara Burke, leader, July 10, 1860. From that time on I was constantly devoted to the preparation of the outfit - horses to buy, wagons and harnesses to be made, and men to break in, which was a more difficult task than the breaking in of horses, for most of them were not only inexperienced but illy adapted by habits of life for the service. They were from England, Ireland and Scotland, and had come out with letters of introduction to people of influence in the colonies who felt under obligation to do something for them, and this was the grand opportunity and they embraced it. Most of them having been brought up 'a gentleman,' as the term is understood in England, they knew nothing of hard work, and, besides, they were one and all, as a matter of course, preeminently ignorant of frontier, or, as it is there called, bush life, and consequently wholly unfit for an expedition of that kind. I well remember the remark I made to Mr Burke upon my first visit to the Royal park, where the men were quartered, when he asked me what I thought of them. I told him if I could have my way I would select my men from some of the old experienced bush-men in the prison, rather than start out across the continent with such raw recruits; that I did not believe one-half of them could harness up a team and drive it. And my assertion proved even more than true, for there was not even one man among them that could put together a four-horse team and drive it afterwards. The purchasing of the outfit devolved entirely upon me. The wagons were fitted up in the government prison, the clothes and boots also were made there, and even the horses were shod there - in fact, the prison was the industrial institution of Melbourne and the source of mechanical products. This brought me in contact with the prisoners, who were kept under the strictest discipline, and tobacco was prohibited. When I went to look after the work they constantly importuned me to bring them some tobacco, and not thinking of prison rules, I was rather liberal with it among those that were at work for me. I did it to encourage them to hasten on with the work. But my liberality made me trouble. Other prisoners became jealous of those that worked for me, and laid information against me. I was watched, soon caught in the act and brought before the superintendent, where I learned the enormity of the crime. Fine, £20 to £50 for first offense, and three months imprisonment, in the discretion of that officer. I told the authorities that I knew they did not supply rations of tobacco to prisoners, but did not know it was such a crime for one to give them some; that I was anxious to get on with the work and wished to encourage them to expedite it, and hoped they would overlook my offense and impose as light a fine as their rules would admit of. So a fine of twenty pounds was imposed, and Mr Burke was told that I was not to be allowed among the men any, more. I owe that fine yet, and am likely to, and if they keep the account they will always have something due them. I was told that if I wished to give the prisoners tobacco I should put it in the loading I was sending out, as they would be sure to find it and appropriate it. But things soon came to a stand-still inside. Not a man knew what I wanted done. But I would not go inside until I had an order from the superintendent to admit me. Things were soon put to rights. The men only held off until my presence was allowed. I supplied them with tobacco until my work was done, but was more careful in my manner of distribution. I only mention this unimportant incident to illustrate the constitutional meanness of those miserable men toward each other—jealousy and cussedness. The expedition was expected to be ready to start by August 20, and I was determined that nothing should be left undone on my part. I was obliged to let out some of the work to private individuals, as I could not get some things done in the prison. Finally I had the entire outfit completed in time, and on the seventeenth of August, 1860, the whole party were assembled at the Royal society's hall to sign the articles of agreement for the expedition. Robert O'Hara Burke, leader; George James Landels, second; Charles D Ferguson, foreman; Mr Wills, astronomer; Hermann Becker, doctor and botanist; Dr Ludwig Beckler, artist; subalterns, William Brah, John Drake, John King and Patrick Lanon. There were a number of others whose names I have forgotten; besides, there were two Sepoys, or East Indiamen, drivers of the twenty-six camels; four wagoners and twenty-six head of horses. Three extra wagons were hired to take some of the loading as far as Swan Hill, a distance of two hundred and twenty- miles. The day after signing the articles was Saturday, and a great day at the Royal park. The governor and lady, with a retinue of lesser officials and distinguished friends, turned out to inspect our outfit, and I was gratified by receiving many compliments from his excellency and others, upon the result of my labors, although I was not satisfied therewith myself. A grand lunch was provided for all. One or two of the men became a little too hilarious through excess of beer, and when Mr Burke heard of it he sent for me and gave me orders to discharge them and send them out of the park. I suggested to him that I had not the: power to do that; I could only suspend them from duty and report them to him; that it was his province to discharge them, which he did. On the morning of the twentieth, before ten o'clock, over sixty thousand people had assembled to witness the starting, from the Royal Park, of the Victorian Exploring expedition, on its long and perilous journey. How few of all that party thought they were starting out upon their last journey upon earth. Little did any one of them think that of all that party there would be only one left to tell of the disastrous fate of the expedition; but so it was. Although no expedition ever before started out under more favorable auspices, or seemed more sure of success, yet providence or fate ordained its utter annihilation. The route was due north, and the objective point was the Gulf of Carpentaria, supposed distance about two thousand miles. The caravan caused no little commotion in traversing the settled portion of the country embraced in the first few hundred miles. Cattle and horses along the route stampeded from terror at the sight, and even at the smell of the camels, wafted on the breeze in advance of their appearance. It was said that some wild horses on the ranches ran thirty miles before stopping, such is their instinctive aversion to and terror of the camel. Men, women and children along the line and from stations and ranches many miles distant, came in to see the camels, and in nearly every instance the black natives, to whom the camels were alike a curiosity and a dread, compared them to the emu, for the reason, I suppose, of their long neck, for in no other feature could I see the slightest comparison. They were very shy of them, and never could one of than be induced to mount the animal or even go very near one. 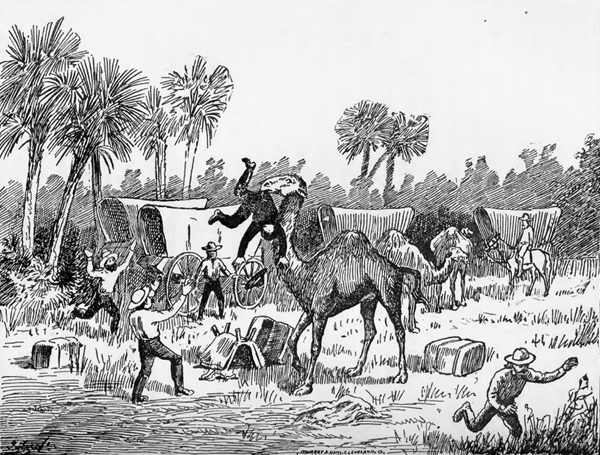 They would only approach in crowds, and those behind, in their eagerness to see, would push those in front uncomfortably near, and when the camel would make that gurgling sound which it often does when displeased or cross, it was laughable to see the blacks tumble over each other to get out of his way or reach, for they invariably approached in squads of a dozen or more. The men had much sport with the blacks and camels, for the latter seemed to thoroughly detest the blacks, and would show viciousness whenever they approached, and seemed to know the blacks were afraid of them. I had rather an unenviable position among so many inexperienced men, although I really believe there was not one among them but would get up in the night without murmur, if I required it of him. Mr Burke often used to tell me I worked too hard, and would ask me why I did not let the men do it. I told him if I stood and looked on it would take till doomsday for them to learn, but if I showed them by doing it myself, they would eventually learn. Mr Burke was an Irishman, and a gentleman in every sense of the word. He had been an officer in the Austrian army; and was, no doubt, a good soldier and a brave man, but he had the hasty impulses of his countrymen, and was not calculated, for that reason, for an unwarlike expedition of that kind. He was kind and generous to a fault, but, let anything happen out of the .common routine, he was confused, then excited, till finally he would lose all control of his better judgment. Then, again, when he made up his mind to do a thing, he never considered the consequences. He had thorough discipline, and no one dared presume to contradict him. Still, if taken the right way, one could influence him to a change of order or policy. Often he would come to me with an order which to me seemed erroneous. I would simply say, 'Very well, Mr Burke' - that was enough for him to know that I did not approve of it. He would at once ask if I did not think it best to do so, when I would suggest whether it would not be preferable to do so and so, and he would at once say, 'You are right; do as you like'; when, if one had said to him at his was not the best way, he would have it done his way, let it result as it might. Landels would have made a better leader than Mr Burke, being a cooler and more collative man, with a good deal of Indian experience before coming over with the camels. Young Wills was a son of Dr Wills of Ballarat, and as almost a native, having come to the colonies when mere child, He was an attaché of the Melbourne observatory, and had he lived would have made his mark in the world. Dr Ludwig Becker, the artist, was a very genial man, always trying to assist someone, not as yet having had opportunity to display his artistic skill. He often asked me to find him something to do so he could assist the poor men. Finally, one day, I asked Lanon, an Irishman, if he had not something for the doctor to do. 'Yes, sur, of coorse I have,' said he. 'What is it?' mildly asked the doctor. 'Groom that camel,' said he, and gave him a brush and pointed him to one of the most vicious camels in the whole lot. As the doctor approached, the camel let out one of those gurgling sounds which frightened him, and he asked if the animal was kind. 'Kind as a lamb, sur,' said Lanon. Then came another gurgle and the doctor retreated. 'Just say, salaam, salaam, to him,' said Lanon, 'and he will be kind as a kitten, sur.' The doctor again approached cautiously, pronounced the magic words, and at last got his brush to work on the camel's fore leg. The doctor wore a pair of cotton moleskin pants, as thick as a board and twice as strong, and about two sizes too large for him, especially in the seat. All of a. sudden I heard a most unearthly yell for help, in both German and English. I looked and saw the doctor hanging in the air, about ten feet from the ground. The camel had got him by the seat of his pants, between his teeth, and was raising and lowering him, to the height of not less than ten feet, the doctor kicking and swinging his hands and calling for help, when at last the pants gave way, and just at the moment when the doctor was highest in the air, down he came upon his hands and knees, and then struck out without waiting to regain his feet. While I could hardly refrain from laughing, I felt the necessity of reproving Lanon, and asked him why he selected that vicious camel for the doctor. He looked as solemn and sedate as a judge and answered, 'I never saw him do the likes of that before, sur.' Neither had I. However, the good doctor never applied for any more, jobs. The expedition made Cooper's Creek about one thousand miles due north of Melbourne, on the sixteenth of December, and there made a cache for provisions and, supplies and established a relief corps, and were preparing- to proceed in pursuance of the original plan and in accordance with prior instructions for the second half of the journey, the terminus of which was the southern and extreme point of the bay of Carpentaria. But just at the moment of breaking camp new orders arrived from Melbourne for a division of the party with a view to divergence into three separate routes; ultimately to converge at a common rendezvous on the shores of the great northern bay. This was deemed impracticable by those in charge of the expedition, and not only extra hazardous, but contrary to the terms of their contract of service. The order not only produced consternation for the increased danger to small parties, but produced a state of unhappiness that could not be quieted or allayed. Mr Burke, true and faithful to his education of obedience, regardless of consequences, even in a remote region where his superiors could have no knowledge of the country and its dangers, and he knowing the orders unwise, insisted on following instructions to the letter. Consequently many of the men refused to obey Mr Burke's orders for the division of the party of the expedition, and finding cheerful obedience to duty on the part of the men wholly departed, and, moreover, finding it impracticable to manage and be responsible for three separate companies, I resigned my commission and received an honorable discharge from Mr Burke, and returned on foot and alone to Melbourne. Mr Landels, who came from India and had special charge of the camels and the camel drivers and grooms, soon followed me. The diversity of sentiment and want of common and mutual interest among a mixed multitude, of English, Irish, German, Scotch and East Indians, but few, if any, practical business or even working men, and none of them experienced in border life and the hardships of such overland expeditions, rendered the duties and responsibilities of the manager of the train doubly onerous. After my resignation and the departure of Mr Landels, the expedition, in some manner, resumed its northern course, and was absent and lost to the world, and even to the relief corps which they left at Cooper's creek, for the space of four months, when a remnant of it reached there, April 21, 1860, only to find the relief corps gone and nothing left to eat. The result was, every vestige of the expedition disappeared forever, save only one man, King, rescued alive from the blacks. A full and minute history of the expedition would be of exceeding interest to many, and I have sometimes thought I would relate it from its inception to its tragic end, but my final conclusion is that it would be impossible for me to do so without casting reflections upon some who took an active part therein; besides, files of innumerable documents of conflicting testimony are in the archives of the Royal Society of Melbourne, and as the terrible tragedy is now past nearly thirty years, I refrain from more than general remark, treading lightly on the ashes of the dead. The errors committed on either side were errors of judgment and not of motive - errors of the head and not the heart. It was a grand scheme and enterprise of the Royal society in the interest of science and geographical discovery, and its ultimate catastrophe is not, in my judgment; chargeable upon the Royal society. Many scandalous slurs were indulged in towards that honorable body, but from my own personal knowledge, I knew the insinuations were groundless; and direst charges were made against the society, which never had the shadow of a foundation in truth. I will mention only the general progress of the expedition without very minute details. Our progress was very slow through the settled portions of the country, mainly from bad roads, or rather no road at all in the open country, but in no small degree detained and hindered by visitors who swarmed around us, many coming from a distance of fifty miles, so curious were they to see the grand cavalcade, especially the camels and their turbaned drivers from Hindoostan, which were a novelty in Australia. The men gradually became accustomed to the work, and seemed anxious to learn, so the task was not so hard upon me as at first. But men cannot learn their work, of this nature, in a week nor in a month, however anxious they may be to do so. And I do now and here wish it to be distinctly understood that I do not assume to myself the sole and exclusive knowledge of the management of such an expedition in such a country, or that I was perfect at all times and under all circumstances, in manners, temper or spirit; but I did then, and do now claim that from the experiences of my whole life, up to that day, I was enabled to know, and did know my business as well as, and even better than anyone else connected with the expedition; and had my advice been followed, touching the route, the order and discipline of the train men, I have not the least hesitancy in asserting that, in my judgment, the expedition would have returned in triumph. But the fate of the Victorian Exploring expedition is now a matter of history and briefly told. It succeeded in its main object - to cross the Australian continent - the first ever to have accomplished it - but with the loss of the entire party save one, King, who alone remained to relate the sorrowful tale. A government relief party sent out, found him alive among the black people and rescued him - sick and emaciated, sad and sorrowful. He survived but a short time after he was brought in. 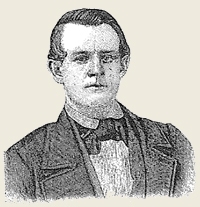 Burke's and Wills' remains were found and brought into Melbourne, where they were buried with honors which they richly deserved and for which they had laid down their lives. And now there is a noble monument in Melbourne erected to the memory of those men, on whose paneled base, for a hundred generations, may be read the honored names of Burke and Wills, as the first pioneers to cross the continent of Australia. Landels, who left the expedition soon after I did and returned to Hindoostan, has since died, leaving the narrator hereof the sole surviving member of that famous expedition.